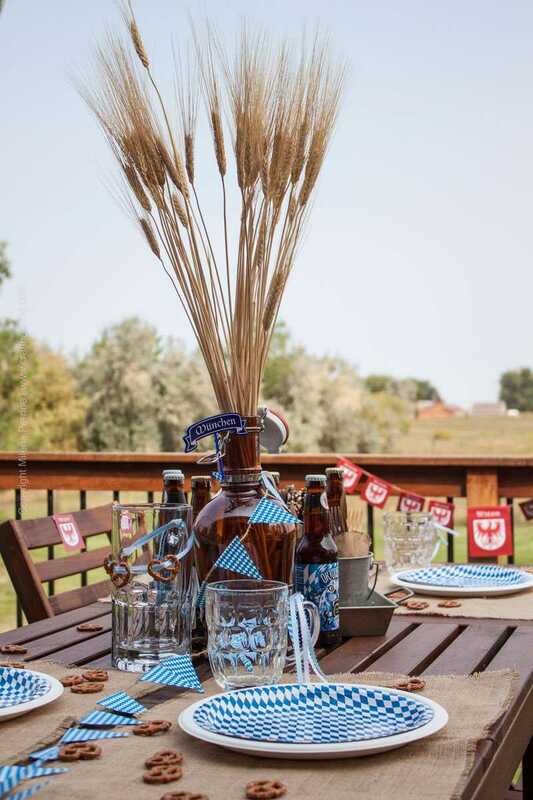 Oktoberfest Party Tablescape - part of Craft Beering's Oktoberfest Bash! 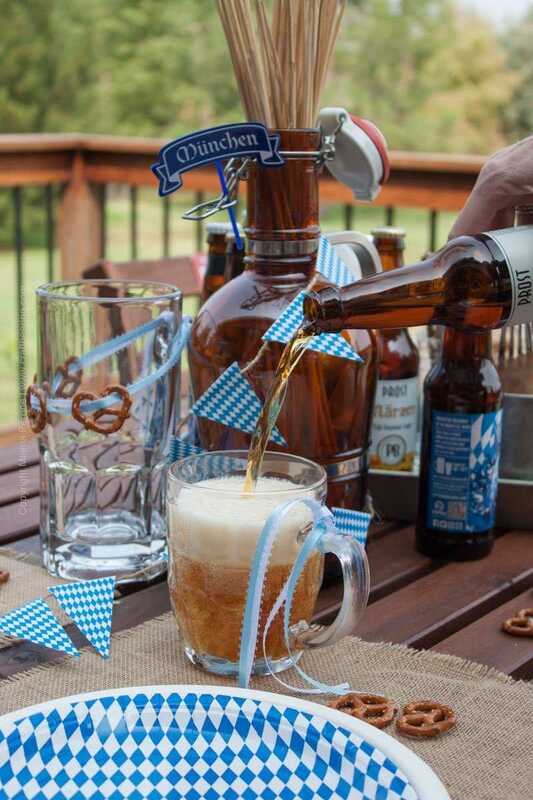 Take a look at our Oktoberfest party tablescape. That’s right! We have set the table!!! For an eighteen day long partee! Aka – the first annual Craft Beering Oktoberfest Bash! This year Oktoberfest begins on September 16 and will go on until October 3rd. There will be delicious Oktoberfest eats, traditional and innovative craft brews, Bavarian beer hall songs and guests!!! What’s a party without the guests, right? Whether they are dressed up in dirndls and lederhosen or not. Typically, you won’t see me cheering for Fall’s arrival. Actually, it has never happened and I doubt that it will. Thank goodness for Oktoberfest to ease me into the colder, shorter, gloomier days of what always seems to be falling into a slumber…aka Fall/Winter. And thank goodness for Chris, whose favorite time of year includes Thanksgiving/Christmas and the cold, snowy seven-hour long days of January. That’s how one turns out after growing up in Florida… In any event, Chris helps me get through ‘slumber’ season. Right now though – our focus is on Oktoberfest. Yes, it is possible to feel very grateful for the marriage of two people that took place back on October 12, 1810. Regardless of his marital indiscretions, one has to acknowledge King Ludwig I and his good taste in women, for princess Therese of Saxe-Hildburghausen was a famous beauty and a smart lady and was definitely worth the celebrations that gave rise to centuries of Oktoberfest festivities. Thank you Bavarian (and by extension all German) people for so enthusiastically embracing and for so generously sharing Oktoberfest with the rest of the world. Beer truly is an omnipotent unifier! Of course we are going to have a party! Welcome to Craft Beering Oktoberfest Bash 2017! …and we shall waste no time at all pouring a beer while waiting for the guests and the food to arrive! That first beer before a party officially starts always tastes best, right? Some of our guests will show up bearing platters of gorgeous, drool-worthy Oktoberfest food:) Yeah, we know who to invite. Stick with us 🙂 And we are fully stocked with napkins and have plenty of beer to go around! Proper craft beering takes serious planning. Especially the Oktoberfest Bash kind. 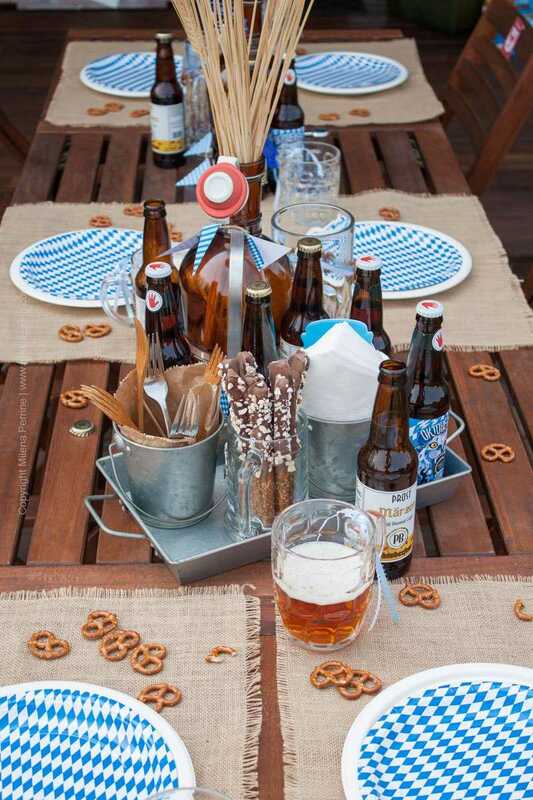 Let’s talk about the blue and white lozenge pattern on the table that is so symbolic of Oktoberfest decor. Both the colors and the pattern have been associated with the Bavarian flag since the beginning of the House of Wittelsbach rule in 1180. Some Bavarians believe that they represent the beautiful Alpine blue lakes of Bavaria and the white clouds reflected in them. Later in history, the lozenge pattern was established as the banner of Bavarian armies, especially during the Napoleonic Wars. Stay tuned for a post next week touching on the history, flavors and generally happy life of the delicious beers of Oktoberfest! 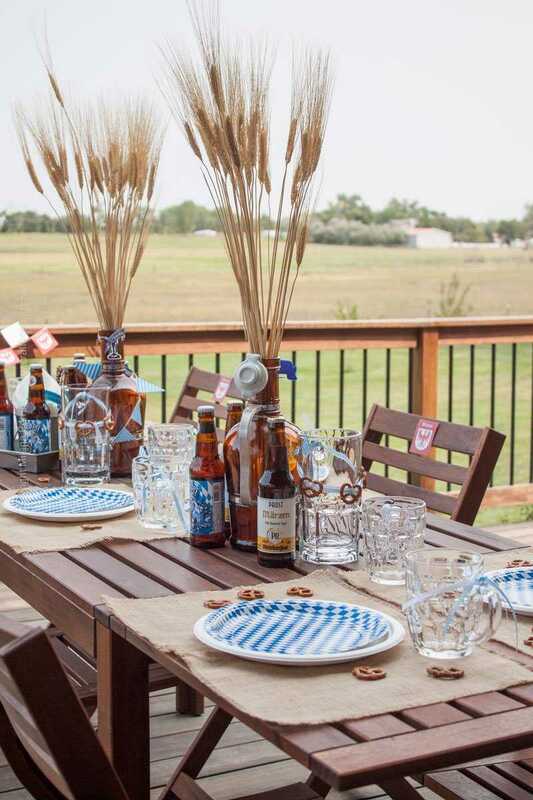 We will have other examples in addition to the two Märzen varieties featured in this Oktoberfest party tablescape and will discuss how they are made. Beer tasting included. In short, Wiesn is the Bavarian dialect word for the German term Weisen, which means grassy open area. The best way to translate it into English is to say ‘fairgrounds’. The nearly 42 hectare grounds near St. Pauls Church in Munich where Oktoberfest takes place are referred to as “Theresienwiese” or the fairgrounds of Therese. So yes! We are ready to party and hope you join us and our food bearing guests! Stay tuned for the official Craft Beering Oktoberfest Bash 2017 start later this week! Such a fun set up. I love the pretzel ribbons. Layering the paper plates is brilliant. It is such an inexpensive way to jazz things up! I love it. Wow! Thank you so much, very grateful! Now this is a tablescape my husband would enjoy!! Looks great! I saw your post featured at Dishing It & Digging It. Sounds good Ann:) It is quite simple to put together too, just enough to create a festive atmosphere without expanding too much effort. Such a wonderful Oktoberfest tablescape! Thank you so much for sharing with us at Dishing It & Digging It & congratulations on being featured this week. Happy Fall! I love your tablescape, especially the pretzels tie around the mug. Thanks for the history lesson, and sharing on Sunday’s Best. That’s adorable, love the pretzels styled up on the outside of the mug. perfection! I am with you on dreading the short days Milena. Enjoying the last days outside celebrating Oktoberfest is a great way to distract us from whats coming. Love your table and how you used the printables, everything you do is so well done. I have shown your blog to Hubs and he was impressed with it. ( He loves beers). I look forward to reading all your posts while you celebrate, I expect they will be epic. Beautiful table! I live about 10 minutes from Frankenmuth, MI which hosts a very large Ocktober Fest celebration every year. I’ve never been but that may change after reading this post! Wow, you are in luck Sandra! Prost, hope you part take in the Frankenmuth festivities! Really cool, yes! 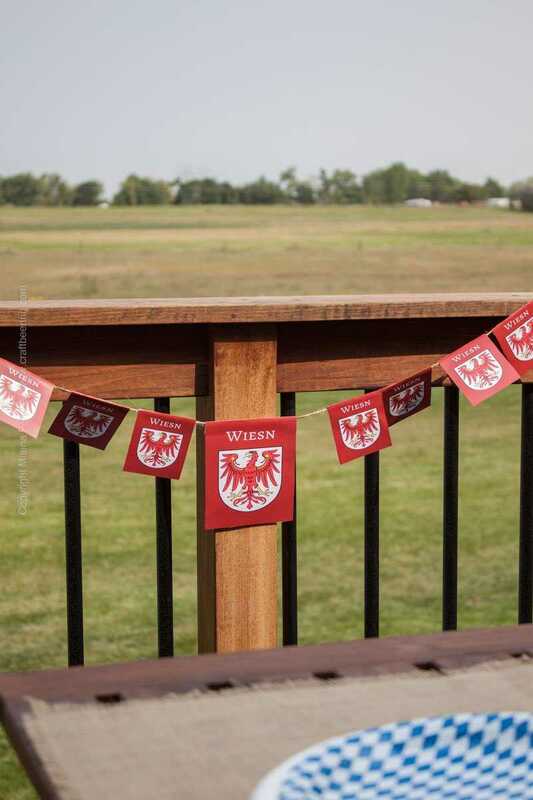 We brought two of the garlands I made to a friend’s backyard wurst party and he loved them too! Awesome history lesson, Milena! Love it! I feel a little smarter. 😉 The table looks great! Thank you Shelley! It is such a beautiful table, isn’t it? Love IKEA! I LOVE IT! This is so fun and festive! My husband and I are attending Oktoberfest in 2018. This is getting me excited! So cool! I bet you will have a great time! You don’t even notice the thousands of drunk people once you start drinking:) Gotta practice lifting the 1 liter steins before you go, haha! I had no idea of the history behind Oktoberfest. So interesting! I always thought it was just an excuse to drink beer–not that anyone needs an excuse. . .I’m getting really excited to see everyone’s Oktoberfest recipes :). PS, tell Chris I’m really impressed. I didn’t know it was possible for anyone to like short days or the month of January! Right? The Bavarian royals have rise to one of the most beloved fests in the modern world, lol! Will definitely let Chris know:) He is one of a kind, lol.